Pyramid Press have recently produced a series of printed material for the Schools Advisory Service. The items were briefed into us over a 3 month period and during this time we had to ensure materials and colours matched throughout the suite of items therefore a keen eye on quality control was essential. The range consisted of 2 page and 4 page A4 leaflets, questionnaires, CD card holder, an 8 page brochure and a credit card styled membership card. 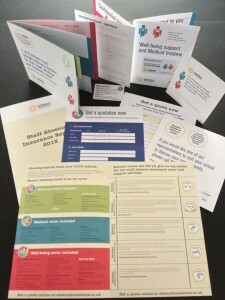 The plastic membership cards were attached by hand to the front of the ‘Well-being Support & Medical Treatment’ leaflet, not a simple task considering there were 50,000… we enjoy a challenge! The 8 page brochure contained tabbed pages that required precise die cutting, collating and stitching and our finishers had to ensure the tabs were lined up correctly. This project illustrated Pyramid’s commitment and attention to detail with aplomb, delivering a multifaceted print project within the time schedule and budget, but more importantly, within our client’s expectations.